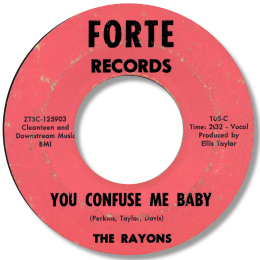 The first disc by this girl group “You Confuse Me Baby” has some currency on the UK dance scene but in truth it’s a somewhat charmless and messy uptempo number. A substantial increase in quality was inevitable when – like fellow Forte artist Tony Ashley – they moved on to the Decca company to cut at the Hi studios. Names like Don Bryant, Dan Greer and of course Willie Mitchell appear on the labels to this superb double sider so you know you’re in for a treat. Do You Love Me is a typically well constructed Memphis ballad, but I’m Giving Up Baby is in another league altogether. I love the way the girls sing the hook in splendid harmonies, and the touches that Teenie Hodges plays are sheer genius. The “sliding” horn charts are also well worth a mention. This 45 is now very rare indeed – enjoy it here rather than spending a fortune on it! UPDATE ~ Great sleuth Greg Burgess writes to send the names of the Rayons. Based on a CD released by those nice guys at Numero on the Forte label (buy it!) 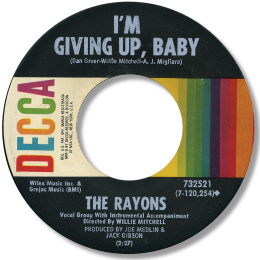 Greg has persued leads in the notes to the CD to name the three women in the Rayons as Melbra Lewis, Doris Davis & Margaret Ann Perkins. As he triumphnatly writes "all sisters"! Wonderful stuff Greg! FURTHER UPDATE ~ I'm delighted to say that Evangelist Leigh Drew has been in touch with some extra info about the Rayons. He has corrected one of their names (now included above) and says that " I wanted to thank you for posting my Mom and my Aunts, The Rayons.... My Momma just passed away and it was so great to hear them from back in the day. My mother, the oldest, Theola Perkins, became their manager when they switched to back to gospel music "The Perkins Sisters". Mr Drew has posted a link to Youtube here which shows the Perkins Singers in action. Simply wonderful! I'm very grateful to Mr Drew for taking the time / trouble to get in touch and offer him my sincere condolences on the passing of his mother.